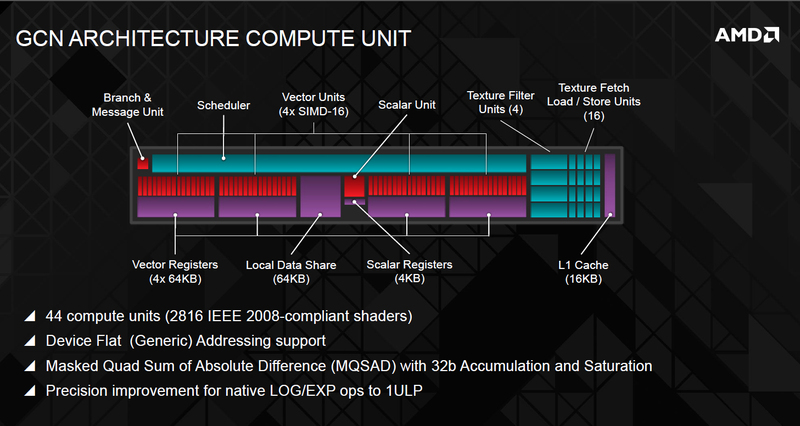 When you have worked with images in OpenCL before, you may have wondered how to store them. Basically, we have the choice between using buffers or image objects. The later seems to be designed for that task, but what are the differences and how do they perform differently when applying a certain task? For a recent project, I needed to decide which storage type to use and I want to share the insights here. This is a follow-up article to my previous post where I already evaluated filter operations in OpenCL. I did not only need to store plain images but rather a complete image pyramid, like visualized in the following figure, originating from a scale space. The pyramid consists of four octaves with four images each making up 16 levels in total. In each octave, the size of the images is always the same. With my used example image, the four images in the first octave have the size of the base image which is \(3866 \times 4320\) pixels. \(1933 \times 2160\) pixels are used in the second, \(966 \times 1080\) in the third and \(483 \times 540\) in the fourth octave making up a total of 88722000 pixels. Figure 1: Image pyramid consisting of four octaves with four images each. The image is half-sampled after each octave. Buffer objects are basically one-dimensional arrays which can store any data you want. All pixel values of the image pyramid are stored as a one-dimensional array with a length of 88722000 in this case. This introduces overhead in the access logic, though, since the pyramid is by its nature not one-dimensional but rather three-dimensional with a non-uniform structure, i.e. not all images in the pyramid have the same size. I use a lookup table to minimize the overhead during computation. However, there is still the overhead for the programmer which needs to implement the logic. Image buffer objects are created from buffers (so a cl::Buffer object is additionally necessary on the host side) and are offered by convenience to use a buffer which behaves like an image. However, it is very limited and can e.g. not be controlled by a sampler object. But it turns out that it is sometimes faster than buffers on my machine as we will see later. In theory, it would also be possible to use one-dimensional images (e.g. image1d_t in the kernel code) but this type of object is limited to the maximum possible width of a 2D image object (16384 on my machine) and hence not suitable to store an image pyramid with 88722000 pixels. Image buffers are not under this constraint but rather restricted by the CL_DEVICE_IMAGE_MAX_BUFFER_SIZE value (134217728 on my machine). Images are a special data type in OpenCL which can be one-, two- and three-dimensional. The 16 levels of the image pyramid are stored as 16 image objects, e.g. as std::vector<cl::Image2D>. Handling of this object type is easiest for the programmer and as it will turn out is also very fast and I ended up using this storage type for my project. Cubes are very similar to image types. They basically add a third dimension to the image objects. The idea here is that each octave, where all images have the same size, is stored in one cube resulting in four cubes in total. The overhead should be less for cubes than for images but I could not confirm this definitively in the benchmarks below hence I did not use this type. The idea behind the four storage types is also visualized in the following figure. Figure 2: Four different storage types (buffer/image buffer, images and cubes) used in this benchmark. The first quads (buffers) represent pixels, the other images. The four types and their properties are also summarized in the table below. The column with the kernel calls denotes how often the OpenCL kernel must be executed in order to apply one filter to the complete image pyramid. Images need the most since the filter kernel must be applied to each image layer in the pyramid individually. The other types contain the notion of an octave in the pyramid and hence know that four images have the same size. It is, therefore, possible to apply the filter function to the complete octave at once. Before diving into the benchmark though, I want to describe a bit the hardware details about the differences between buffers and images. Note that I use an AMD R9 290 @ 1.1 GHz GPU in the benchmark and hence concentrate only on the GCN architecture. It is not very easy to find detailed information about how the different storage types are handled by the hardware (or I am too stupid to search). But I will present my findings anyway. The most important note is that image objects are treated as textures in the graphics pipeline. Remember that GPUs are designed for graphics tasks and the thing we do here in GPGPU with OpenCL is more the exception than the rule (even though it is an important field). Textures are a very important part of computer graphics and when you have ever developed your own (min)-game you know how fruitful this step is. As soon as textures are involved the whole scene does look suddenly much better than before. It is therefore only natural that the hardware has native support for it. As you can see, the transistors responsible for textures are located on the right side. There are four texture units (green horizontal bars) where each unit is made up of one filter unit and four address units. Why four times more address units than filter units? I don't know if this was the design choice but I would guess that this has something to do with bilinear interpolation where four pixels are needed to calculate one texel. It is also possible that this has something to do with latency hiding and hardware parallelism. Memory fetches may need a lot of time compared to the execution of ALU instructions in the SIMD units. In order to stay busy, the hardware executes multiple threads at once so that while one thread still waits for the data the others can already start with execution. But each thread needs data and must issue memory requests hence multiple store and load units are necessary. Note that these texture units are located on each compute unit and are not shared on a per-device basis. My device has 40 compute units so there are 160 texture units in total. The address units take the requested pixel location, e.g. an \(x\) and \(y\) coordinate, and calculate the corresponding memory address. It could be possible that they do something like \(cols*y + x\) to calculate the address. When interpolation is used, the memory addresses for the surrounding pixels must be calculated as well. Anyway, requests to the memory system are issued and this involves the L1 cache (16 KB) next to the address units. This cache is sometimes also called the texture cache (since it holds texels). Since the cache is shared between all wavefronts on the compute unit, it offers an automated performance gain when the wavefronts work on overlapping regions of the same data. E.g. in image convolution the pixels need to be accessed multiple times due to the incorporation of the neighbourhood. When the wavefronts on the compute unit process neighbouring image areas, this can speed up the execution since less data needs to be transferred from global to private memory. It is loaded directly from the cache instead. There is also a global L2 texture cache with a size of 1 MB which is shared by all compute units on the device. Usually, the data is first loaded in the L2 cache before it is passed to the L1 caches of the compute units. In case of image convolution, the L2 cache may hold a larger portion of the image and each compute unit uses one part of this portion. But there is an overlap between the portions since pixels from the neighbourhood are fetched in the image convolution operation as well. So, the function read_imagef(image2d_t image, sampler_t sampler, int2 coordinates) is needed to access the pixels. This is necessary so that the hardware can optimize the code and make use of the texture units where the sampler is used to configure it. But how can the cool functions I promised before now be used in OpenCL or equivalently: how to set up the texture filter units to do what we want? Interpolating: set the sampler to CLK_FILTER_LINEAR for bilinear and CLK_FILTER_NEAREST for nearest neighbour filtering. The additional texels are loaded automatically and the interpolated value is returned. If you need this interpolating functionality, you can also store other data than pixels in the image objects and get automatic interpolation. Out-of-border handling: set the sampler e.g. to CLK_ADDRESS_CLAMP_TO_EDGE to repeat the last values or use one of the other constants. The modes are a bit limited when not using normalized coordinates, though; but still, better than nothing. Type conversion: this is controlled by the used function in the kernel. Above read_imagef was used which returns a float value. Use e.g. read_imagei to return an int. Note that the functions in the kernel are independent of the real format set up on the host side. How do buffer objects now differ? They don't use the texture units for a start since we do not provide a sampler object and do not use the built-in access functions. But they also use the cache hierarchy (bot L1 and L2) according to the docs. The programming guide by AMD states on page 9 “Actually, buffer reads may use L1 and L2. [...] In GCN devices, both reads and writes happen through L1 and L2.” and in the optimization guide on page 14 they claim further “The L1 and L2 read/write caches are constantly enabled. Read-only buffers can be cached in L1 and L2.”. This sounds for me that both caches are used for buffers as well but the benchmark results below suggest that a cache-friendly local work-group size seems to be important. Regarding performance of the different memory locations, the general relationship is global > texture cache > local > private (cf. page 13ff of the optimization guide for some numbers). So even when image objects and hence texture cache is used, it may still be beneficial to explicitly cache data which is needed more than once by using the local data share (located in the centre in the block diagram). It is not surprising that global memory is the slowest and private memory the fastest. The trick is to reduce the time needed to transfer the data in the private registers of the SIMD units. E.g. for \(p_1\) the memory address is calculated as lookup.previousPixels + lookup.966 /* = 3866 / 4 */ * 2 + 10. The lookup array is filled on the host side and transferred to the GPU as an argument to the filter kernel. The following snippet does the computation on the host side and includes an example. * possible to provide the level and the pixel location and retrieve the image value in return. The same technique is used for the image buffers as well. When it comes to enqueue the kernel at the host side, the following code is executed for each octave. Note the used offset which stores the number of previous images (e.g. 8 in the octave = 2 iteration) and depth = 4 which makes this kernel a 3D problem: the filter is computed for all image pixels in all four images of the current octave. The code for images and cubes is not very exciting, so I will not show any details for them. Check out the implementation if you want to know more. It is now time to do some benchmarking. I start by testing a normal filter operation (called single in the related article). A short summary of the implementation is: unrolling and constant memory is used for the filter but no other optimizations. The first thing I want to test is the difference between the default local work-group size, i.e. setting the corresponding parameter to cl::NullRange, and the size manually to \(16 \times 16\). This is a common block size for an image patch computed by a work-group and is also the maximum possible size on my AMD R9 290 GPU. It turns out that this setting is quite crucial for buffers as you can see in the next figure. It really is important to manually set the local work-group size for buffers. Performance totally breaks for larger filters. The fact that a fixed size increases the speed that much is, I think, indeed evidence that buffers use the cache hierarchy. Otherwise, the local size shouldn't matter that much. But, there are still some differences compared to image buffers. Even though they also profit from a manually set work-group size, the effect is not that huge. Maybe the texture address units do some additional stuff not mentioned here which helps to increase cache performance. I don't think that it is related to some processing in the texture filter units since there is not much left. No type conversion must be done and a sampler can't be used for image buffers anyway. Additionally, the address calculation (\(cols*y + x\)) is done in both buffers inside the kernel and therefore executed by the SIMD units. Another possibility would be that the local work-group size is set differently for image buffers than for normal buffers. Unfortunately, I don't know of a way to extract this size when not set explicitly (the profiler just shows NULL). and you want to store a list of points which can be located anywhere in the image pyramid. Suppose further you want later (e.g. in a different kernel call) access the image pixels and its neighbours. Then you need to have access to the complete image pyramid inside the kernel and not only to a specific image. This is only possible when the pyramid is stored in an (image) buffer because then you can read pixels from all levels at once. Another noticeable comparison is between images and cubes. First, the local work-group size does not play an important role in both cases. The differences here are negligible. It is likely that the hardware has more room for optimization since it knows which pixels in the 2D image plane are accessed. Remember that bot \(x\) and \(y\) are provided to the access functions. Second, cubes are consistently slower than images. Even though cubes can be executed with only 4 instead of 16 kernel calls and hence results in less communication with the driver and therefore less overhead. Maybe cubes are too large and stress the caches too much so that the benefit of the kernel calls are neutralized. Anyway, this is precisely the reason why I decided to use images and not cubes to store my pyramid. The next thing I want to assess is the benefit of local memory. The following chart compares the results for fixed size work-groups from before with the case that always local memory is used (implementation details about how to use local memory for this task are shown in the filter evaluation article). Figure 4: Benchmark which tests the usage of local memory. With local (solid) is compared against no usage of local memory (dashed). In both cases, the local work-group size is set to a fixed size of \(16 \times 16\). Note that the dashed values are the same as in the previous chart and are just shown again for comparison. Hover over the points to see the exact number. Click on the label at the top to hide/show a line. The mean values per size are averaged over 20 runs. It is clear that local memory is beneficial for filter sizes \(\geq 5 \times 5\) regardless of the storage type. This is not surprising though since local memory is still faster than the L1 cache. Additionally, the L1 cache is smaller (16 KB L1 vs. 64 KB LDS), so it is to be expected that for larger filters performance decreases. For a filter of size \(3 \times 3\) the situation is not that clear. Sometimes it is faster and sometimes not. Don't forget that the manual caching with local memory does also introduce overhead. The data must be copied to the LDS and read back by the SIMD units. In general, I would say that it is not worth to use local memory for such a small filter. Considering only the lines which use local memory, the result looks a bit messy. No clear winner and crossings all over again. I decided to use normal image types since they are easy to handle and offer full configuration via the sampler object. But I would also recommend that you test this on your own hardware. The results are very likely to differ.